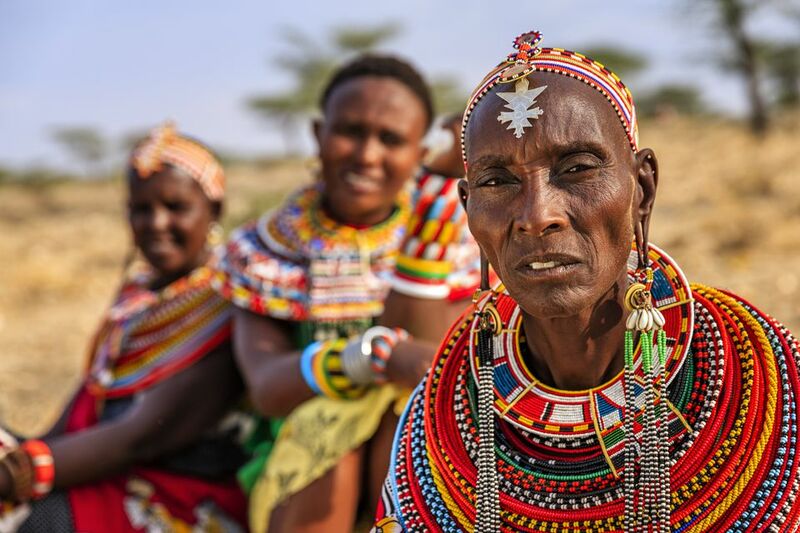 Kenya is a country of many different landscapes, ranging from coastlines washed by the warm waters of the Indian Ocean to arid savannahs and snow-capped mountains. Each of these regions has its own unique climate, making it difficult to generalize Kenyan weather. On the coast, the climate is tropical, with warm temperatures and high humidity. In the lowlands, the weather is generally hot and dry; while the highlands are temperate. Unlike the rest of the country, these mountainous regions have four distinct seasons. Elsewhere, the weather is split into rainy and dry seasons rather than summer, fall, winter, and spring. Despite the diversity of Kenya's climates, several rules can be applied universally. Kenya's weather is dictated by monsoon winds, which help to make the high temperatures of the coast more bearable. The winds also influence the country's rainy seasons, the longest of which lasts from April to June. There is a second, shorter rainy season in November and December. Of the intervening dry months, the December to March period is the hottest; while the July to October period is the coolest. Generally, rainstorms in Kenya are intense but brief, with sunny weather in between. Nairobi is situated in Kenya's Central Highlands region and enjoys the pleasant weather for most of the year. Average annual temperatures fluctuate between 52 and 79 degrees Fahrenheit (11 to 26 degrees Celsius), giving Nairobi a similar climate to California. Like most of the country, Nairobi has two rainy seasons, although they start a little earlier here than they do elsewhere. The long rainy season lasts from March to May, while the short rainy season lasts from October to November. The sunniest time of year is December to March, while June to September is cooler and often more overcast. Located on Kenya's south coast, the popular coastal city of Mombasa enjoys consistent temperatures that remain hot throughout the year. The difference in daily mean temperatures between the warmest month (January) and the coldest months (July and August) is only about five degrees Fahrenheit. While the humidity levels are high on the coast, ocean breezes prevent the heat from becoming uncomfortable. The wettest months are April to May, while January and February see the least rain. Mombasa's climate is comparable with that of other coastal destinations, including Lamu, Kilifi, and Watamu. Northern Kenya is an arid region blessed with abundant year-round sunshine. Rainfall is limited, and this area may go for many months without any rain at all. When the rains do come, they often take the form of spectacular thunderstorms. November is the wettest month in Northern Kenya. Average temperatures range from 68 to 104 degrees Fahrenheit (20 to 40 degrees Celsius). The best time to travel Northern Kenyan highlights like Lake Turkana, and Sibiloi National Park is during the southern hemisphere winter (June through August). During this time, temperatures are cooler and more pleasant. Western Kenya is generally hot and humid with rain occurring throughout the year. Rain usually falls in the evenings and is interspersed with bright sunshine. The famous Maasai Mara National Reserve is located in Western Kenya. The best time to visit is between July and October, after the long rains. At this time, the plains are covered with lush green grass, providing ample grazing for the wildebeest, zebra and other antelope of the annual Great Migration. Predators are attracted by the abundance of food, making for some of the best game-viewing on the planet. At 17,057 feet, Mount Kenya's lofty summit is perennially capped with snow. At the highest elevations, it's cold all year round, especially at night, when the temperature can drop as low as 14 degrees Fahrenheit (-10 degrees Celsius). Typically, early mornings on the mountain are sunny and dry, with clouds often forming by midday. It is possible to hike Mount Kenya throughout the year, but conditions are most accessible during the dry season. Like most of the country, Mount Kenya's dry seasons last from July to October, and from December to March. The late summer months in Kenya are the country's dry season, with the exception of the mountains, which experience a more traditional four seasons. While June can still be quite wet, the other months are great for visiting wildlife and the Maasai Mara National Reserve. July and August are also prime time for beach vacations, thanks to the warm-but-not-too-hot temperatures (typically around 80 degrees Fahrenheit) and light rain. Kenya's dry summer-like weather continues into the fall months. In September, there's almost no rain, and temperatures hold steady around 85 F. This is one of the best months for watching wildlife. What to Pack: If you're going on safari during the fall, bring light-colored clothing, a good hat that won't fly off in the wind, sunglasses, and plenty of good sunscreen, as the sun across the plains can be extremely harsh. By October, rain increases, as do temperatures. October and November can be good months for seaside vacations, as long as you don't mind the occasional intense rain. Migrating birds in the Great Rift Valley and Aberdare National Park are another draw for visitors. During the spring rainy season, which begins in April, temperatures typically average around 85 degrees Fahrenheit (29 degrees Celsius). March is the last comfortable month before the rains begin in April. While the temperature remains the same, increased humidity can make travel more difficult. What to Pack: The rainy season is still quite warm, so you'll want to pack light clothing, but also extra waterproof options and rain gear. Don't forget comfortable walking shoes and sandals.